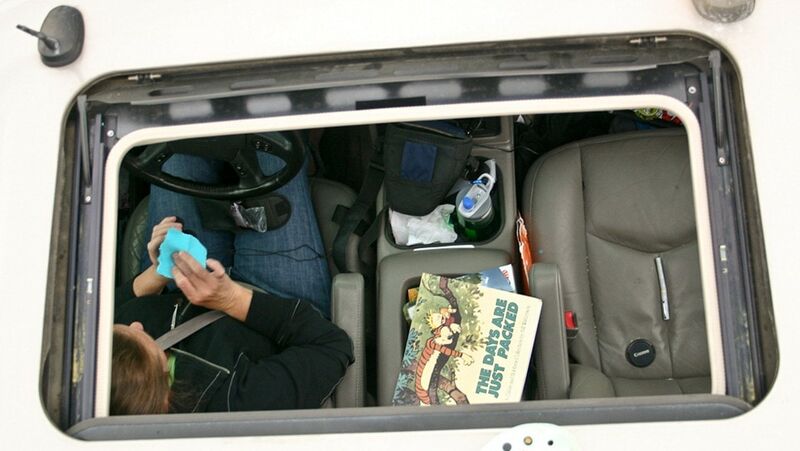 Road trips are a wonderful opportunity to have open-ended book discussions with your children. If you have the time, and a super-long road trip, consider listening to an audio-book and then talking about your selection. 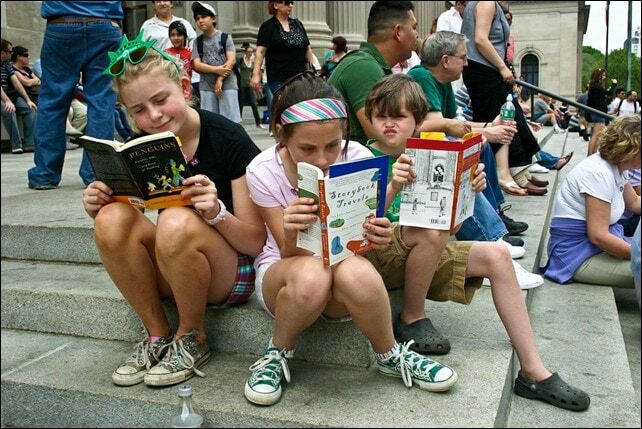 It can be difficult to choose a book that is interesting and worthy of discussion when various age groups travel together. Try to find a book that is entertaining, and open to interpretation on many levels. I’ve found some great candidates, and guidance for book discussions, in Deconstructing Penguins: Parents, Kids and the Bond of Reading by Lawrence and Nancy Goldstone. 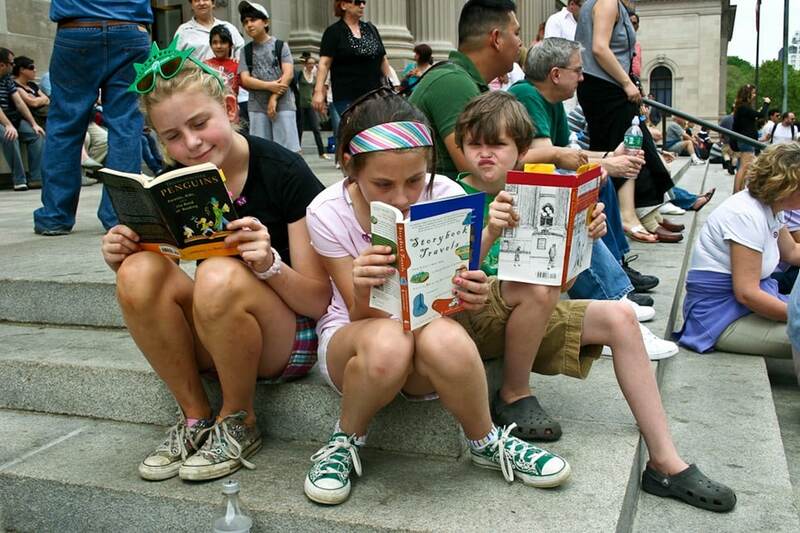 Veterans of library groups for tweens (ages 7-11,) the Goldstones have found that children can participate fully in sophisticated literary analysis, but that what they read does matter. The authors encourage children to look at every book as a mystery that the reader can solve to discover if the author has successfully conveyed his message through the use of plot, setting, characters, and central conflict. For more thoughts on finding books to discuss see What about the classics? If you have planned ahead, you can get many books on CD at your local library or by ordering online from Amazon.com. Since I’m rarely that organized, I’m grateful that I can easily download audio-books to my iPod using the iTunes store or my local library’s online services. I have also had great success using Audible.com to download audiobooks while traveling. Mercury Theatre on the Air has a collection of classic radio drama from the 1930′s that includes Rebecca, Mutiny on the Bounty, The Pickwick Papers, Around the World in 80 Days, Treasure Island, and Dracula. Lit2Go offers a collection of children’s literature that allows you to search the collection by title, author, or reading level. Educators will love the reading activities that accompany most titles. For example, for “The Boy Who Cried Wolf” from Aesop’s Fables, the reading activity suggests making a concept map showing cause and effect. LibriVox allows you to download free audiobooks from the public domain. Budding actors may also volunteer to record and upload audiobooks. This ecclectic collection includes stories and poems by Walt Whitman, Rudyard Kipling, and Jules Verne. 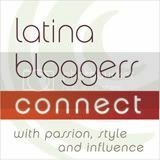 Ejunto provides a collection of free historical and philosophical audio books. This where you can download Machiavelli’s The Prince, William Shakespeare’s The Tragedy of Macbeth, or James Madison’s The Federalist #10. Although George Orwell’s Animal Farm is rarely recommended for tweens, the Goldstones recommend this book for fourth graders. Since I was traveling with a 2nd and a 6th grader at the time, I figured that this book could appeal to both. Also, since we were listening to the audio-book version, both children could handle the difficult vocabulary and sophisticated language. It was easy to pause the iPod as necessary when encountering unfamiliar words or ideas. How is Animal Farm a fairy story? In the prologue, C.M. Wodehouse explains that Animal Farm is a fairy story in the sense that it lacks a moral, and that fairy stories exist outside of morality. Does it seem right that the bad guy is just as likely to win (as the good guy) in this and other fairly tales? What is communism? How is Animal Farm communist? Suggestions for discussing this complex subject: How to Teach Kids About Communism and Communism. How is Snowball like Mr. Nobody (the culprit who is often blamed for misdeeds in our home.) Why do people in power like to blame everything on a scapegoat? How does this unify public opinion and encourage support for the leader? How do bullies use this tactic in the school setting? Somehow, we found ourselves discussing the same questions about Animal Farm that the Goldstones suggest in the chapter titled, Putting It All Together: What Is The Book Really About? We decided that Orwell was telling us that, regardless of the outcome, it is the individual’s responsibility to speak up for what they know is right – even if, or especially if, there are a bunch of sheep trying to drown your voice with mindless chanting of the oppressor’s message. This is true in any group, whether it is school, city, state, etc. The kids were excited about questioning authority and this led to a fruitful discussion about when and where authority should be questioned. While fictional storybooks are fabulous road trip companions, they don’t appeal to every audience. Sometimes its better to pursue a non-fiction interest, such as an obsession with fossils. Take a look at our ever-expanding Enrichment guide for more ideas! Its also great time for dad to catch up on reading. Over the Christmas break I read 3 books thats 3 more than I have read in 12 months! Our two are only little, but I’m enjoying discussing the books I used to read when I was there age “fox on socks, socks on tocks” etc.. Teaching children with communism can be good, if they were shown the good and bad sides of this kind of system. I like animal farm it teaches us not to be greedy with power. What a great idea. I think people often under estimate children’s intelligence. Kids are capable of great ideas and grasping complex concepts. I think that listening to an audio book and participating in a discussion about the book would have been really fun as a child. 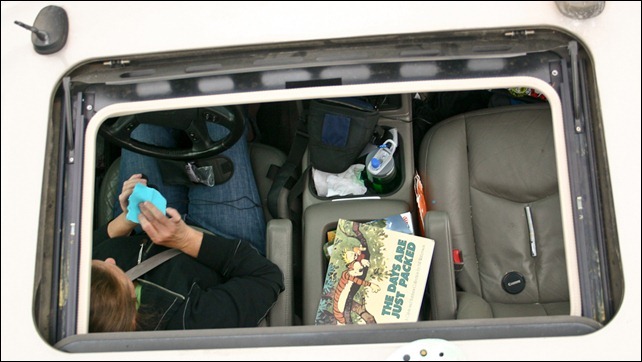 It seems like a great way to make long hours in the car pass by quickly and a great bonding experience.